The Kresge Foundation, a US philanthropic private foundation, has funded Inyathelo to build South African Advancement capacity since 2005. 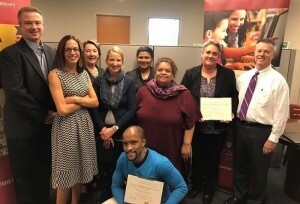 As part of the conclusion of this initiative, Inyathelo’s Programme Director Nazli Abrahams, Programme Officer Jocelyn Collins and four South African higher education fundraising directors attended a customised course with The Fund Raising School at the Lilly Family School of Philanthropy at Indiana University late last year. The course was taught by faculty members Drs Tim Seiler and Genevieve Shaker and The Fund Raising School Director Bill Stanczykiewicz. Course input from faculty member Dr Lilya Wagner’s book Leading Up: Transformational Leadership for Fundraisers highlighted the key skills of a modern fundraising leader. These include creating and communicating a compelling vision, promoting and initiating change, forging alliances and partnerships, valuing diversity, leveraging IT while considering human needs, and balancing professional demands with one’s own needs. Another important part of the curriculum was finding out more about the DISC assessment system, which helps individuals to discover their behaviour/personality styles. The four factors of Dominance, Influence, Steadiness and Compliance are key to this assessment tool.